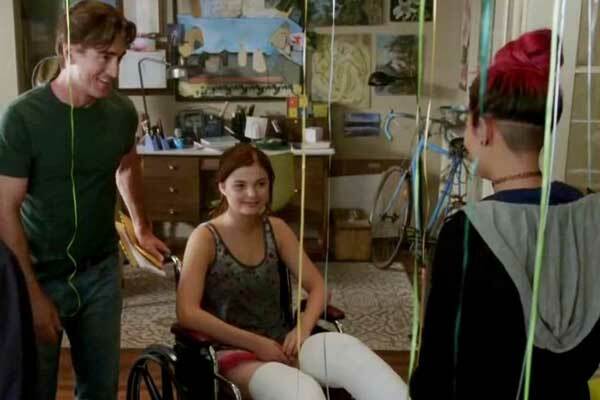 Quinn (Stefanie Scott) is a sweet, smooth teen whose mother has just died, and Quinn would like to speak to her again. (Uh, someone should really explain “death” to this chick.) 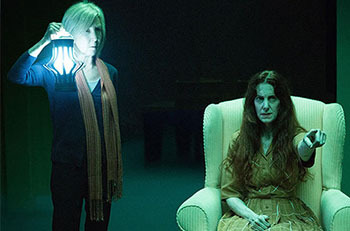 She visits retired old psychic Elise (Lin Shaye), who proclaims she doesn’t visit “the other side” anymore because it’s too dangerous. Whereupon she visits the other side, wanders around in darkness, is attacked, and comes back saying she’s never going to do that again. Dermot Mulroney is Cool Dad, Quinn’s widower father, who becomes alarmed for Quinn when oily footprints start attacking her in the night. They seek out Elise again, who says she doesn’t visit “the other side” because it’s too dangerous. Whereupon she visits the other side, wanders around in darkness, is attacked, and comes back saying she’s never going to do that again. Am I sensing a pattern here? She reports that waiting on the other side is a Man Who Can’t Breathe (Michael Reid MacKay, dandied up in mummy attire with a breath mask), who Vaders around in the fifth dimension and tries to drag salubrious Quinn in with him, being all insidious about it. Finding a crack in the dimension when Quinn called out to her dead mother, he’s trying to force his presence into Quinn so he can breathe again. That’s not so wrong, is it? Although, even with his current incorporeal ectoplasmic insubstantiation, he’s still doing a bangup job of leaving oily footprints, grabbing people, possessing people and ruining Dermot Mulroney’s serious drama career. Hooray! Clothes have souls too. And so do scarves! Also, there’s a bride in black trying to kill Elise. Reason? I wasn’t listening. Leigh Whannell, writer of the first two INSIDIOUS chapters, now takes on writing, directing and acting. A triple threat, who does a good job on this stock horror movie that is not so much frightening as silly. Alongside his stockier buddy Tucker (Angus Sampson), he is called in as the Plan B paranormal team when Elise visits the other side for the third time, wanders around in darkness, is attacked, and comes back saying she’s never going to do that again. Whannell is the Gilligan to Tucker’s Skipper – for all the comic relief we don’t really need in this film struggling to find a tone, although he does manage to eke out a story which is a cut above CHAPTER 2. CHAPTER 3 suffers greatly from the absence of Rose Byrne and Ty Simpkins. Not so much Patrick Wilson, who “indicated” his way through CHAPTER 2 like a novice… And every time they say The Man Who Can’t Breathe, all I think about is Alice Cooper in a straitjacket. After a relatively serious tone, movie ends with silly jocularity that folds it neatly into the first INSIDIOUS movie, as Elise jovially tells her two new paranormal pals that they should go into business together, and to start wearing ties, and walks off with them arm in arm. Just like the oily footprints on the hardwood floors, it leaves us feeling dirty, after visiting the other side, wandering around in darkness, being attacked, and coming back saying we’re never going to do that again. Starring: Dermot Mulroney, Stefanie Scott, Angus Sampson, Leigh Whannell, Lin Shaye, Tate Berney, Michael Reid MacKay, Steve Coulter, Hayley Kiyoko, Jeris Poindexter, Ele Keats, Phyllis Applegate.